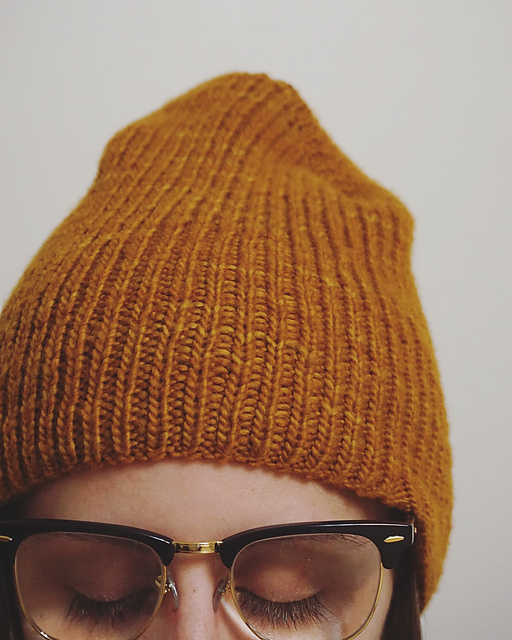 i recently had the pleasure of test knitting a new hat design for the incredibly talented paige parkin aka @knitdiaries! paige has designed a number of seriously cute and stylish sweaters (rainbow in the storm and piper are two of her designs that are VERY high on my to-knit list), so i was pretty excited to be involved in the testing group for her new slouchy ribbed hat, the make it fitted, make it slouch. if you follow paige on instagram you know she has an undeniable talent for creating really beautiful marls, so i wanted to pull out something special from my stash to honor her new design. i chose a very recent acquisition, my first skein of primrose yarn co. adelaide in color paranormal. i chose a drops design fabel superwash merino in a simple navy blue (color 107) as a base. i must say i’m not usually a swatch knitter, but i’ve been diligently doing it for test knits and i am enjoying my growing collection of beautiful swatches! the basic construction of this hat is a simple 1x1 rib, which is kind of funny considering i just finished the 1x1 ribbed mawson hat! paige’s pattern asked for a circular needle, but since i didn’t have the correct size i didn’t think much of it and just grabbed my usual DPns. paige wrote this pattern for all sizes, and in two variations: a fitted crown or a slouchy crown. as a big fan of slouchy hats (and versatility), i chose to test out the slouchy crown in the adult small size. to finish out the crown, i learned two new techniques: german short rows and a 3 needle bind off. for the german short rows, i definitely wished i had purchased the correct size circular as it got pretty confusing. but for the bind off, my dpns worked great! i love the way my finished hat fits, and it has the perfect amount of slouch. i also love that i can fold up the brim to change up the look! the design is simple and excellent for both men and women, and combining two yarns together makes for endless color opportunities. i can’t wait to make another one and perfect my german short row skills! download the pattern for make it fitted, make it slouch here, and make sure to follow paige on ravelry and instagram so you don’t miss any of her designs!